Reviewing some beekeeping starter kits and resources, beekeeping tips and news, and we're even going to get the kids and family involved for some outdoor fun while learning about bees and their role in our ecosystem, and more. 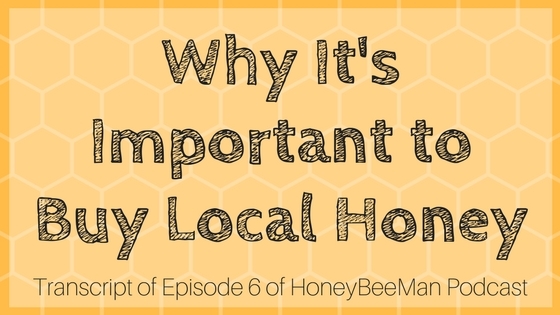 Today we’re going to talk about why it’s important to buy local honey. First of all, do you know where your honey came from? Did you buy it at the grocery store? Did you buy it from a health food store? Did you buy it from a health food grocery store? Did you buy at a farmer’s market from a local beekeeper? Often, honey is imported. Some of our honey comes from China and some of the honey from China is diluted with corn syrup. There has been some legislation to stop this “honey dumping”. My point today is just to tell you that you might want to think about where you buy your honey from. It’s not a good idea to buy China honey with corn syrup, not my idea of what I want to eat as far as honey. I’ll give you a good example of honey that is diluted with something. If you’ve ever eaten honey from Kentucky Fried Chicken restaurants, they don’t even call it honey, it’s called a “honey sauce,” which means it has a little bit of honey in it but it’s mostly corn syrup. It’s not really all that good either. If you’ve ever tasted it, it kind of leaves a bad taste in your mouth. So where do you buy good honey? Your best bet is to buy local honey. There is plenty of local honey available. Anywhere you live, there is honey available from local beekeepers, pretty much all over the world. I would highly recommend that local beekeepers is where you should buy your honey. It’s the freshest honey and the beekeeper can tell you exactly where that honey came from, exactly what type of honey it is, and what kind of nectar created it. You can learn a lot about the honey just by talking to your local beekeeper. You’ll know it’s pure and you’re not going to have corn syrup in your honey. That’s why I would recommend purchasing your honey local. The other thing that I should point out is a lot of these health food grocery stores actually sell bulk honey right out of a large pail. The pail will have a spigot on the bottom of it. They’ll have empty jars sitting there on the shelf and you can pick up whatever size jar you want and simply put it under the spigot, fill it up, put a cap on it, take it to the register and pay. Oftentimes this honey may be beekeeper honey that is local. However, you really don’t know where they’re getting this honey and it’s probably going to be quoted out or bid out. They’re going to send out a bid, they’re going to buy thousands of gallons of honey, and they’re going to take the lowest bid. What typically happens there is you’re going to have blended honey. The reason they blend honey together like that is so that you get a consistency of the batches. If you go to a local beekeeper, chances are you’re going to get a batch of honey that was extracted from a certain nectar source and that honey is going to have different flavors than a blended honey. If you’re looking for consistency, the blended honey might be okay. However, the things that you have to keep in mind are if you’re buying this honey out of a bulk tank at a grocery store, how do you know that the bulk tank was cleaned properly before that honey was added to it, and how often does that bulk tank get emptied out and cleaned. In other words, if they just dump new honey in on top then that tank may not be cleaned for years. The last time I checked at my local health food grocery store, the spigot was so disgusting that it was the last place I would even consider buying honey. I honestly would not consider buying honey from a place like that, and that’s supposed to be supposedly organic honey. We’ll talk about organic honey another day, that’s almost an unheard of thing anymore, to have organic honey, because the honeybees are so susceptible to mites that you almost have to treat your honeybees for mites. It’s virtually impossible to raise honeybees without some form of treatment, even if it is a natural form of treatment that is not a harsh chemical. It’s just a really good idea to understand where your honey comes from, what’s in it, make sure it’s pure 100% honey with no additives for the best quality. Buy local. If you buy your honey from a local beekeeper, you cannot go wrong. This is a great podcast series that MarkZ the Honey Bee Man recorded back in 2007 where he goes through his 10-minute-lessons in beginner beekeeping. It's a great resource for anyone getting started and the audio from the episodes are still hosted on TalkShoe and iTunes, but it's the internet and information can disappear into the void at any moment, especially after a podcast has been retired, so I wanted to make sure this information was available for everyone to use. I know our community has several folks who are hearing impaired that might be interested to read the info as well, so I've transcribed them and posted them here as articles for everyone. Episode 6: Is It Important to Buy Local Honey? Episode 8: Will Eating Local Honey Help With Allergies?